Empty dots show current vacancies. Independents caucus with Democrats and are shown in blue. As it stands today, Republicans control both chambers of Congress. The midterm elections in November could change everything. Will November bring a 'wave'? NEW RICHMOND, Wis. – When handwritten postcards from strangers across the country landed in the mailboxes of Democrats here after Christmas, the national significance of their special election hit home. The postcards, sent to every Democratic household in western Wisconsin’s state Senate District 10 by Postcards to Voters, a volunteer group based in Georgia, asked residents to elect Democrat Patty Schachtner to the open seat. On Jan. 16, Schachtner beat GOP state Rep. Adam Jarchow 55 to 44 percent — a startling outcome in a district that Donald Trump had won by 17 percentage points. “People think that this is a red county, but it’s certainly not trending that way,” said Rebecca Bonesteel, Democratic Party chairwoman in Wisconsin’s St. Croix County, which includes New Richmond. Schachtner’s victory generated national headlines that underscore the dominant political question of 2018: Is a “wave” election forming that will sweep scores of Democrats into Congress, governorships and legislatures? Minnesota is at the epicenter of the drama, with two U.S. Senate campaigns, a competitive governor’s race and two vacant U.S. House seats. County Party Chair Rebecca Bonesteel spoke as the St. Croix County, Wis., Democrats discussed strategies for getting more Democratic candidates to run for state offices. Presidents’ parties typically lose some seats in midterm elections, and Trump’s anemic approval ratings could make enough Republicans vulnerable in November to shift the balance of power nationwide. Democrats must flip 24 seats to take over the U.S. House of Representatives. 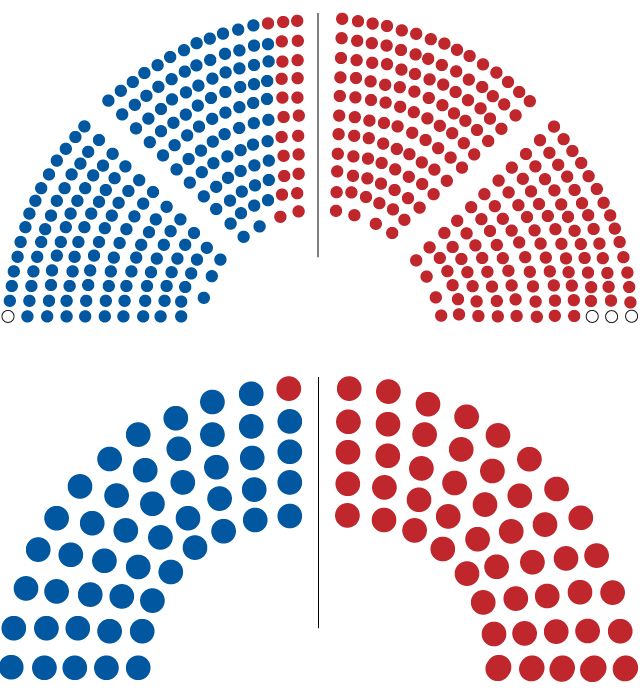 Republicans control the U.S. Senate, 51 to 49. There are 33 GOP governors, and their party controls 32 legislatures. Special elections in Minnesota last week provided no clear clues about how things will shake out here this fall. The DFL retained a southeast metro Senate seat, while Republicans held a state House district in southwestern Minnesota. 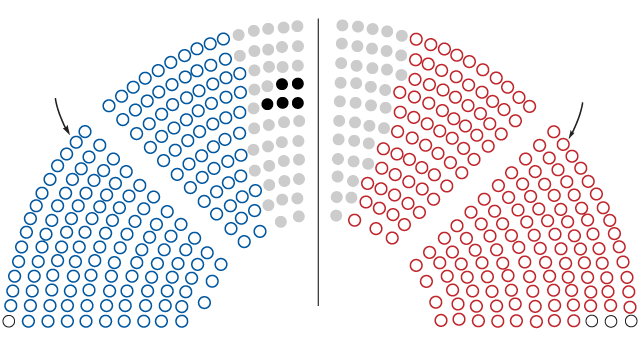 In the House, all seats are up for re-election. However, experts say there are 80 seats in competitive races. Five of these seats are in Minnesota. 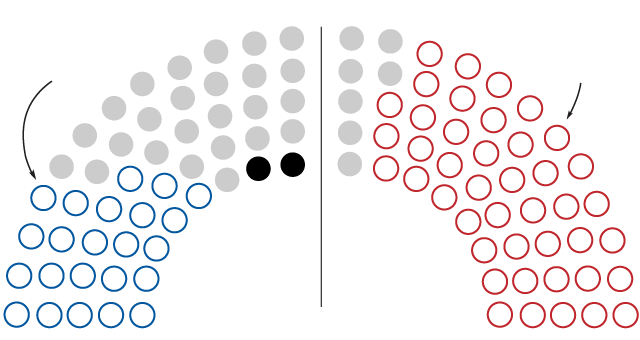 In the Senate, there are 34 seats to be filled. A national Democratic wave could stymie the president’s agenda in Congress, and Democrats probably would launch new inquiries into Trump’s campaign and administration. If Democrats take over state legislatures this fall, they would lead redistricting after the 2020 census. Those consequences could become the foundation of a strong Democratic challenge to Trump in two years. There are some early signs of a wave: A Democrat won a Missouri House seat on Feb. 6 in a district that Trump carried by 28 points. On Tuesday, a Democrat won a Florida House seat in another district Trump won in 2016. It was the 36th Democratic pickup of a GOP state legislative seat since the 2016 election. Republicans think they can fend off broad losses. The gap between the president’s approval and disapproval rating, which had been in double digits for weeks, has narrowed to single digits in some national polls. A Star Tribune Minnesota Poll conducted in January found that 45 percent of Minnesotans approved of Trump’s job performance, while 47 percent disapproved — a statistical tie given the poll’s 3.5 percentage-point margin of error. The generic ballot, a poll question that asks voters which party they want to represent them in Congress without naming candidates, has recently given Democrats a less decisive edge. Last week, a Real Clear Politics average of polls found Democrats favored over Republicans by 6.9 percentage points; in December, many polls showed double-digit Democratic leads. 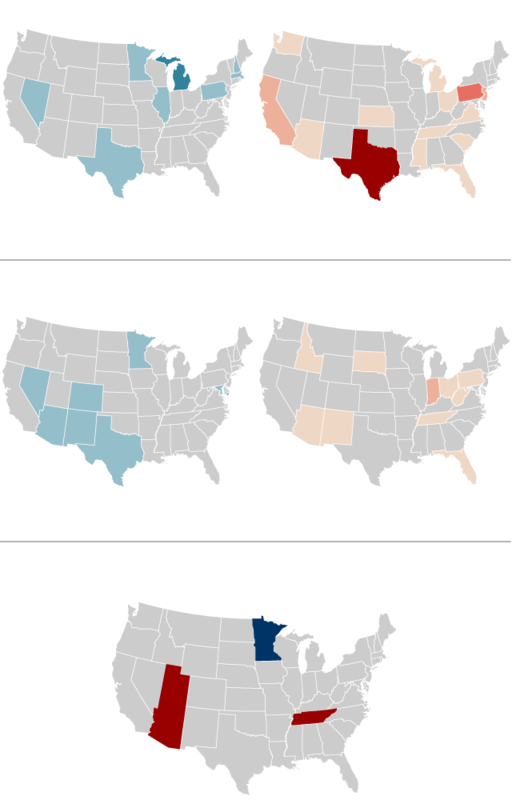 Presidents' midterm party losses: The lower their approval ratings, the more seats they lose. Political waves in one direction or another have increasingly become a feature of national politics. Until a couple weeks before the 2010 election, U.S. Rep. Jim Oberstar, D-Minn., and the DFL Party didn’t see a Republican wave coming, said Brian Melendez, state DFL chairman at the time. Just before the Nov. 2 vote, President Barack Obama’s job-approval rating was 45 percent. The Affordable Care Act had passed that March after a bruising battle. The national jobless rate was 9.8 percent. Republicans gained six governors and six U.S. Senate seats that year. The GOP also snatched 63 U.S. House seats, including the Eighth District seat Oberstar had held since 1975, and took control of the House. The state party freed up tens of thousands of dollars in the 2010 campaign’s final days to help Oberstar, but it was too late, Melendez said. Democrats also lost control of the Legislature, but elected DFL Gov. Mark Dayton. Melendez said today’s volatile political climate makes it difficult to predict what will happen in November, but he thinks the popularity of Trump’s tax cuts might fade after taxpaying season. “This should be a good Democratic year,” he said. Michael Steele was Republican National Committee chairman during the party’s 2010 wave. The ingredients, he said, included a strong message that resonated across party lines, voter enthusiasm and a robust organizing effort. Retirement trends in the U.S. House and Senate: Retirements from Congress can be an indicator of the future strength of political parties. So far in 2018, Democrats seem to have an edge. Several longtime Republicans in competitive House districts have decided not to run, eroding the advantages of incumbency for their party. Graphic by Ray Grumney. Sources: News Services. Spontaneous combustion can fuel waves, but money helps. Republican U.S. House candidates collectively raised $570 million in 2010. Democrats’ total: $521 million. In 2017, the Republican National Committee raised $123 million. The Democratic National Committee collected $64.5 million, but its U.S. Senate and House campaign committees exceeded fundraising by their GOP counterparts. Interest groups are gearing up. Organizations funded by the conservative businessmen Charles and David Koch plan to spend more than $400 million before the midterm elections, Tim Phillips, president of Americans for Prosperity, told donors last month. A group formed by Eric Holder, Obama’s attorney general, plans to invest millions of dollars to block Republicans from gaining control of redistricting. The National Democratic Redistricting Committee is targeting elections in 11 states, including Minnesota. Grass-roots efforts like Postcards to Voters can affect elections without spending a penny. The nonprofit, formed in 2017, flooded Alabama late last year with 347,709 postcards asking voters to back Democrat Doug Jones in the U.S. Senate race that he won over Republican Roy Moore. Founder Tony McMullin said volunteers across the U.S. are assigned more than 4,000 voter addresses daily. “There’s already a wave coming,” he said. Left: St. Croix County, Wis., Democrats held their regular monthly meeting held in Champs Sports Bar and Grill in New Richmond. They discussed last month's surprise win by a Democrat in the local state Senate special election. Right: Former County Party Chair Susan Stori passed around a printout of new Democrat State Senator PattyÊSchachtner at the St. Croix County, Wis., Democrats meeting. That’s what happened in St. Croix County, said Democrat Joyce Hall, a member of Hudson’s city council. “Trump’s win mobilized a lot of people to get involved,” she said. The mostly rural 10th District lies along the Minnesota border and has been reliably Republican.